Anglers on the sea between the southern coast of Texas to the top of Maine often fish for redfish. But, what is a redfish? The species of fish you refer to when you say "redfish" depends largely on where you're from or where you're fishing. There are four main species of redfish in the United States and the regions they are found have large areas of overlap. The first species of redfish is the red snapper. These guys can be found in the Gulf of Mexico and along the southeastern coast. They have been seen as far north as Massachusetts, but are not very common that far. 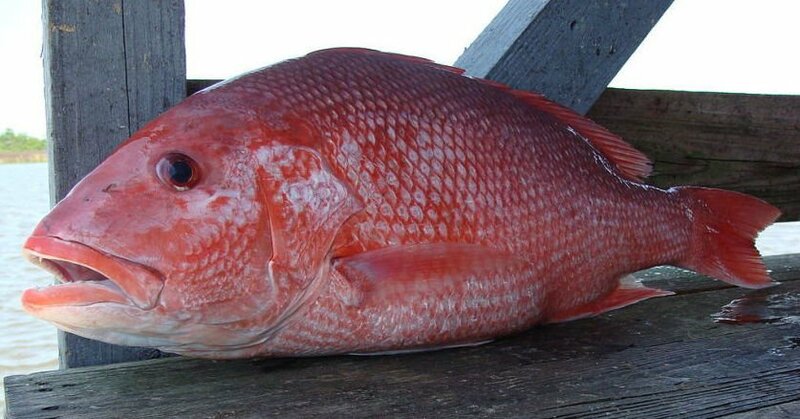 Red snapper are light red, with a higher intensity of color on their backs, and white bellies. The record weight is 85 pounds and they can grow up to 39 inches. These guys are nibblers and pretty picky about bait, so a gentle and patient touch is often needed. They can be found most often in reef-like environments. The second species often referred to as redfish is the red drum. Like the red snapper, red drum are most often found in the Gulf of Mexico and up/around the coast to Florida. They have also been seen as far as Massachusetts. Immature red drum prefer the grassy, marshy areas in bays and estuaries while mature red drum, including bulls, prefer rocky outcroppings like jetties and other man-made features. They have a dark red/brown coloration on their back that fades to white on their bellies. They nearly always have a black spot on the upper part of the tail near the base. They can have multiple spots, although it is somewhat rare. The red drum is a protected game fish as of 2007 and, as a result, commercial fishing for red drum is not allowed in federal waters or most state waters. The third species on this list is the rose fish. The rose fish is a species of rockfish most commonly found in the North Atlantic. They prefer deeper water ranging from 330 feet to 3,280 feet. Mature rose fish are bright red in color while immature rose fish are a lighter/browner color and can be found in more coastal waters. Rose fish can reach upwards of a meter in length, but are often only half that size. The last species in the U.S. to be monikered "redfish" and the only species on the list to actually have "redfish" in its name, is the Acadian redfish. Like the rose fish, they prefer colder waters, generally being found from Virginia to Greenland/Iceland. Unlike the rose fish, they enjoy depths between 230 feet and 1,640 feet especially along the seabed in areas with clay-silt or rocky bottoms. Unlike red snappers, acadian redfish will bite just about anything and like all the fish on this list are particularly tasty. This caused the acadian redfish to be declared endangered until 2012 at which point the species' population was considered rebuilt. Redfish is a popular seafood, mostly in Maine, and is known as a good lobster bait. Now when you catch a redfish you can know what species you are eating!